Paul and his companions then left Paphos by ship for Pamphylia, landing at the port town of Perga. There John Mark left them and returned to Jerusalem. Barnabas rolled over on his cot to gaze at the younger man who had just walked in. He smiled sadly, as he saw John Mark’s nervous face and guessed the errand that prompted his late night visit. Join together to ask God to make us like Jesus. Interpret everything that happens as God answering that prayer. I belive the primary reason the church in America is not impacting the culture is that we expend most of our time, energy, and money doing many things badly instead of the right things well. We are amateurs competing against professional culture-makers. I am confident this would unleash a flood of talent and resources that would turn the world upside down — or rather, right side up! We believe in one God, consisting of one substance — one name, one identity, and one character — sometimes called the Godhead. 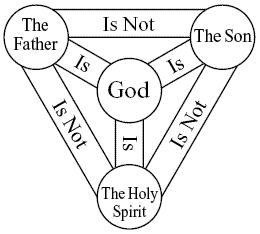 Yet, that name is expressed through three distinct persons, as illustrated by the classic diagram on the left. Theologians use the term “Trinity” to describe this paradoxical mystery, which is explicitly described in the New Testament and often alluded to in the Old. In this lesson, we will be focusing primarily on the Economic Trinity (“How God Acts”) rather than the Essential Trinity (“What God is”). See the “Explore” section for other perspectives.